York General Hospital maintains 25 beds for inpatient care at the acute and skilled care levels. York General Hospital is a Critical Access facility. Twenty-two beds are utilized for the inpatient care of patients who are ill or recovering from surgery. The remaining three rooms, called “Labor-Delivery-Recovery-Postpartum (LDRP)” rooms are designed and equipped for labor and delivery as well as for the care of mother and newborn during their hospital stay following delivery. Skilled care (or “Swing-Bed” care) can be provided for a limited period of time following an acute stay due to an injury, illness, or surgery. It is designed to be short term and rehabilitative in nature. Services such as physical, occupational, or speech therapy are examples of skilled services provided during such a stay. Skilled care to be provided is related to the condition/illness treated during the recent acute care hospitalization. A Physician must sign orders for the skilled swing bed stay. 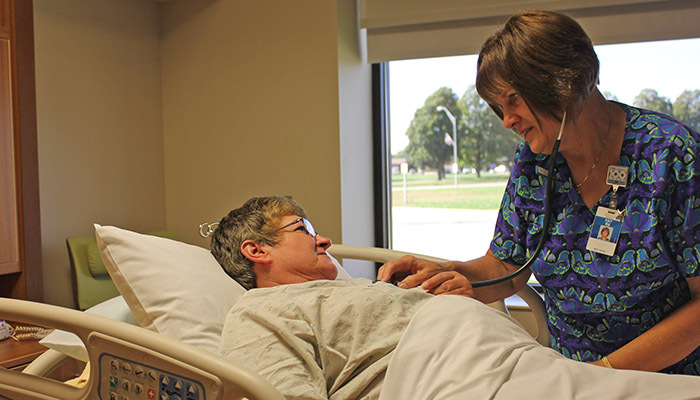 York General’s Social Work department facilitates skilled/swing bed services at the hospital. The York General Hospital inpatient area is located at the north end of the building. For more information call 402-362-0440.